Semester.ly is a platform that helps students plan their semester schedules based on preferences. Students are less than a week away from registering for the Spring 2016 semester, and many are trying to create their ideal schedules, whether that entails Fridays free or avoiding 9 a.m. classes. Students often struggle with this process, since the Integrated Student Information System (ISIS), the University’s online scheduling and billing service, can be unhelpful in planning potential schedules. However, a new web app that addresses this problem has been spreading through the student body through word-of-mouth and social media. Semester.ly is a responsive web application designed “from the ground up” by junior Noah Presler and two of his friends from an internship this past summer at Google. His fellow co-creators, Rohan Das and Felix Zhu, attend the University of Toronto. In an email to The News-Letter, Presler described his original idea for Semester.ly. Presler went on to explain how Semester.ly’s goal is to provide a user-friendly interface to help students design their optimal schedule. 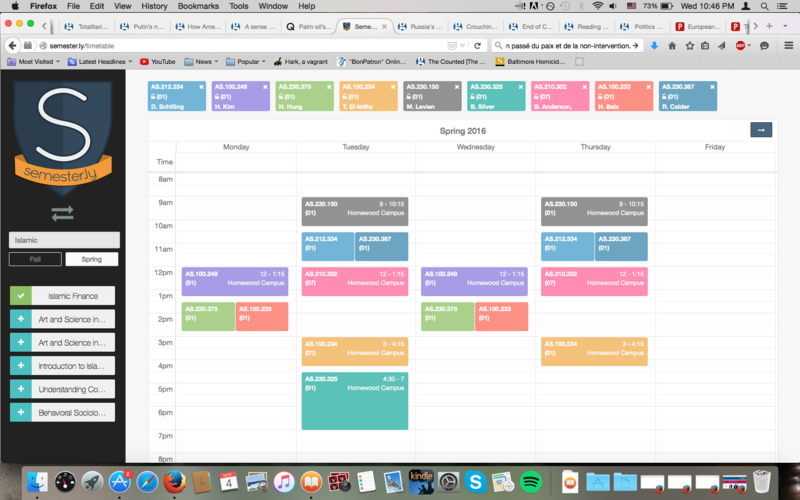 ISIS has its own scheduling function, but it can be inefficient to use, especially if the student has a large number of courses in his or her “cart.” Semester.ly allows students from both Hopkins and the University of Toronto to search for classes they are interested in taking and add them to a hypothetical course schedule. Students can then use the web app to tailor their schedules: mornings free, long weekends or evenings off. Sophomore Raphael Santore wrote in an email to The News-Letter that he recently used Semester.ly to organize his second semester and found it to be a helpful tool when choosing his classes. However, Santore noted that Semester.ly did not always work perfectly. “Sometimes it glitched and would keep sections in my schedule even if I had switched the section, making my schedule look pretty packed, but it was pretty easy to tell when that happened,” he wrote. This same sentiment was echoed by fellow Semester.ly user and Hopkins sophomore Preston Wessells. “The sections didn’t really work out for me. And it doesn’t seem to have all the right time inputs, but I may have just not been able to figure that out,” he said. This difficulty aside, Wessells has found Semester.ly useful in his scheduling for next semester. “I thought it was good for figuring out which classes to take because you can plug in the schedule really quickly and see if it all fits together and see if you like the actual layout of your schedule,” Wessells said. Junior Elizabeth Couch felt that the web app’s lack of instructions made it a little difficult to use initially. However, once she acclimated herself to Semester.ly’s functions she found it extremely useful. Presler and his fellow co-creators says they are encouraging student feedback while continuing Semester.ly’s development. They will move forward with creation of new features, including custom scheduling for extracurriculars and the integration of course reviews. Presler is the CEO for Hopkins Student Enterprises (HSE), helping student entrepreneurs on campus such as Hop and Shake, The Blue Jay Cleaners, Hopkins Student Movers, Blue Jay Boxes, HopInks, The Complete Dorm Room and Hopkins Creative Design. HSE was started in 2006.